Point Judith Fishing Charters and Galilee Fishing Charters at Port Judith Harbor of Refuge – Galilee RI Fishing Charters on the Adventure. Even 80 yr. old has fun. Point Judith Fishing Charter Boats. Enjoy great fishing trips on the waters around Galilee and Pt. Judith in Rhode Island aboard the light tackle charter boat Adventure 2. 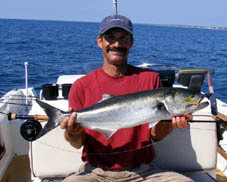 Let captain Earl and Chris take you on fishing charters you will never forget, sailing from Jim's Dock across from Galilee and only minutes from fishing Point Judith waters in Rhode Island. We like doing fishing charters around Block Island and the Narragansett shoreline, but we also do a lot of charters right around Galilee/Point Judith. The inshore waters around Point Judith teem with life during the summer months. 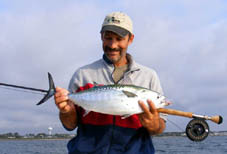 Pods of bluefish, albies, or bass will chase enormous schools of bait that show up that time of year. Albies and Bluefish will pursue schools of bait right up the Galilee channel, with boats in hot on their tails. Many times there are even fish chasing bait on Point Judith pond, near Jim's Dock where our boat is located. No doubt about it, Point Judith can be a great area to fish during the season. We catch a lot of Stripers. Using mostly plugs and soft plastic baits, many times it isn't necessary to go more than 10 miles to find fish, and there were big ones as well as small. There are a lot of aggressive small fish and frequently a big fish will whack a plug and miss the hooks, then a smaller bass will jump on it before the big one could turn around to hit it a second time. There aren't a lot of times when we need to troll to catch fish. Swimming plugs, top water plugs, and soft plastic sand eel imitations catch the vast majority of fish. Leaving early in the morning is often the key to getting a lot of fish. Flounder fishing was also extremely good in the waters near the point. Typical days see upwards of 30 or 40 fish, it's just stellar. Located right across the salt pond from Galilee and Point Judith in Rhode Island. Galilee and Pt Judith have a long tradition of fishing and Adventure has enjoyed being a part of that tradition. We fish Point Judith pond, Point Judith, Westerly, Watch Hill, Ninigret pond, South Shore, Block Island, Narragansett, and Newport. Adventure can handle groups of up to 6 people on one vessel. For more than 6 we provide multiple charter boats. Check out our rates page for weekday specials we may be offering. 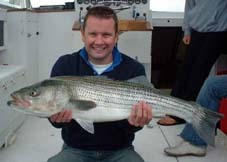 So why not enjoy sports charter fishing in Galilee, Rhode Island on the Adventure fleet. Page last updated February 6, 2013. Book a Point Judith Fishing Charter Today. Big Bluefish on topwater plug. Fly Rod Albie taken at Pt. Judith. Nice Bass West of Point Judith. Pt. Judith Rhode Island fishing. Copyright 2004-2011 Adventure Point Judith fishing charters. All rights reserved.